Can I get you to fit on any bike? Of course. Will it drive well? No. Will it be comfortable? No. I see many bikes pass my fit room that have been cobbled together to get someone on the bike whether the frame is too big or too small. It is very important to be fit first to determine the correct frame size for you. As I wrote in an earlier piece (see X, Y, and Z), not all sizes are created equal. A size small is most times drastically different than a size small from a different company. For example, let’s take a look at the photo in photo 1. The photo shows the front end of a bike that is incorrect. 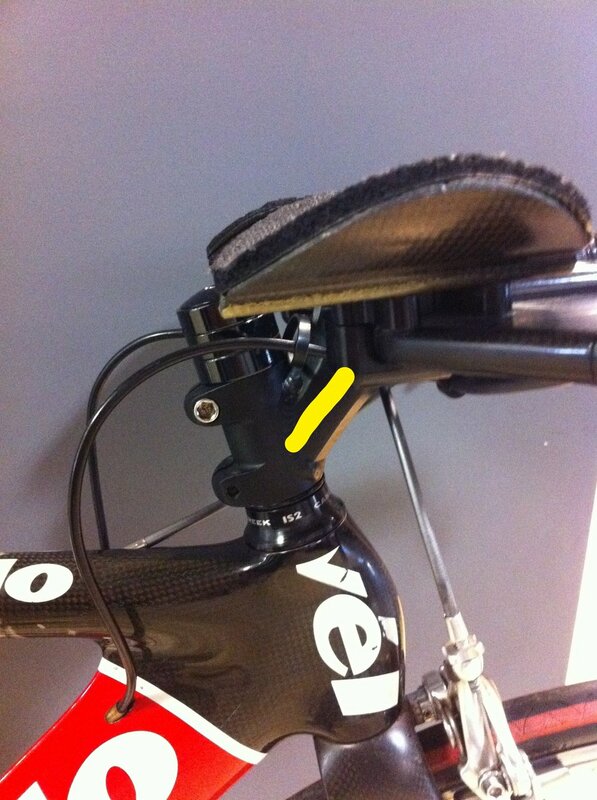 You will see a very steep angle (18 degrees) in the stem; and a stem that is very short for a TT bike (50mm length). What this does is drive the front end of the bike (aero bars/pads/base bar) back on top of the fork and frame, causing poor stability. Check out the second picture. It shows the trail of a bike. Trail is best thought of as the tire patch “trailing” behind the steering axis. More trail is ideal to provide stability and agility. For any bike to be stable, you would want a stem with a nice pitch that lays out in front of the steering axis (see photo 2). However too much trail will make the bike feel sluggish or hard to steer in packs of riders. If you have a stem too short and too much of a pitch (angle) you will put your steering right on top of the steer tube of the bike, thus decreasing the trail. The bike will ultimately be unstable and uncomfortable. Being fit first will allow you to shop for the correct frame size with the proper stack and reach, with the correct seat post setback, stem length and pitch and proper spacers under the stem.